​1​4th​ March ​2017, Mumbai: Nilkamal, a household brand and leading manufacturer of furniture products in India has collaborated with Wello, a social venture. This association will be in the form of manufacturing and sales of Water Wheel, a flagship product of Wello by Nilkamal across India and Sri Lanka. Thereby, adding the Wello-Nilkamal Water Wheel to the brand’s innovative range of products. Technology has fundamentally changed so many aspects of daily life for consumers across the globe for the better. However, one thing that hasn’t changed is the fact that over one billion women and girls still spend hours every day hauling heavy loads of water to their homes. The practice of head loading can cause chronic back, neck, and eye pain, curvature of the spine, and can lead to death during childbirth. The UN recommends 20 liters of water per person per day but because of the challenges associated with water collection, most rural consumers have access to less than 5 liters per day. The time, physical and health burdens of water collection combine to trap entire families in a vicious cycle of poverty. Wello anticipates that by leveraging Nilkamal’s expertise in manufacturing and widespread pan-India distribution network, they will be able to better serve the market of over 250 million rural consumers across India who lacks reliable access to safe water. 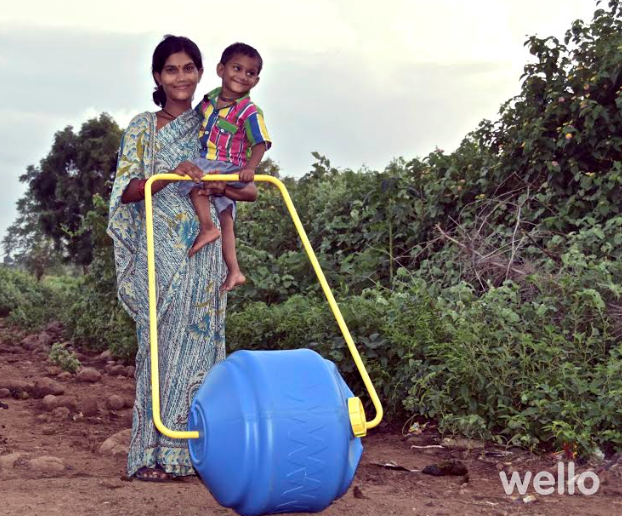 The Water Wheel is the flagship of Nilkamal’s new line of ‘social impact’ solutions; products designed to meet the needs of marginalized or vulnerable populations. Other products in the category include ultra low-flow toilets and school desks. Nilkamal is a household brand across the country, more popular in rural India. The brand vows to take the Water Wheel to the very doors of the needy, at an affordable price, through its extensive distribution network. Wello is a social venture with an ambitious goal: to deliver clean water to a thirsty world. Working closely with our consumers, we co-create affordable innovations that solve the problem of reliable access to safe water. Wello aspires to design products that people not only need, but want to use. Take, for example our flagship innovation - the Water Wheel, a 45L rolling water container that easily ‘rolls’ a day’s supply of drinking water for a household. Nilkamal Limited is the world’s largest manufacturer of molded plastic furniture, and one of Asia's largest producer of molded plastic products. Based in Mumbai, India, the name Nilkamal is synonymous with quality and durability. This reputation is well-deserved - all of Nilkamal's manufacturing plants are ISO 9001/2008 certified and practice Six Sigma manufacturing processes. Their extensive manufacturing infrastructure is supported by a wide and strong sales network of 400+ techno-commercial experts, operating through 39 Regional Offices and 41 Warehouses spread across India.